Hello beautiful friends and welcome to Trash-to-Treasure Tuesday!! Turning old or forgotten items into new treasures is my absolute favorite, and it is even more fun when I get to do it with some of my favorite treasure-maker friends! Be sure to look for links to their projects at the bottom. 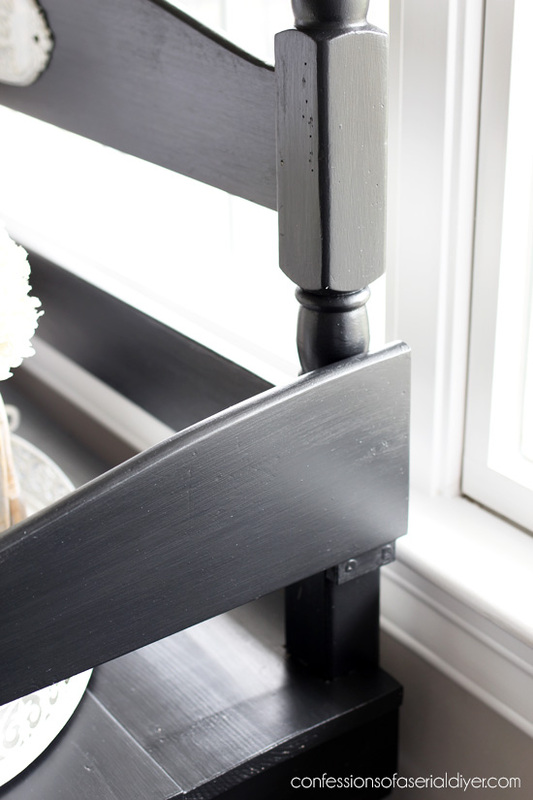 This was long before I had ever attempted a headboard bench of my own. I was smitten with it when saw it and just had to buy it, but over the years it has started to show its age for sure, including those pesky knots you see on the seat. My mom has had this in her guest bedroom for the last several years and recently asked if I wanted it back. Better, no? I rarely use black anymore but I knew this would look sleek and classic in a black finish. 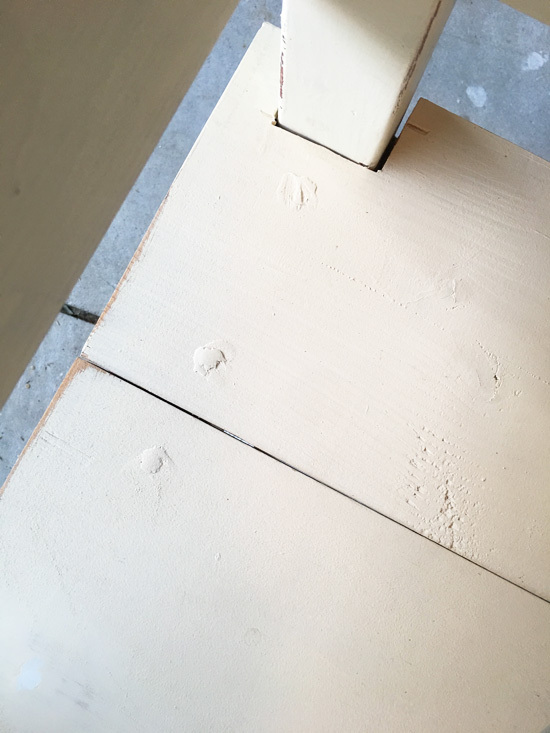 I was able to sand them all smooth before applying the new paint color. The black paint hid any other flaws that were easily visible before also. One of the four corner posts has been cut off on the top also, which I never noticed when I bought it, but I think that only adds to the charm. To paint this piece, I dug around in my stash looking for a black color. 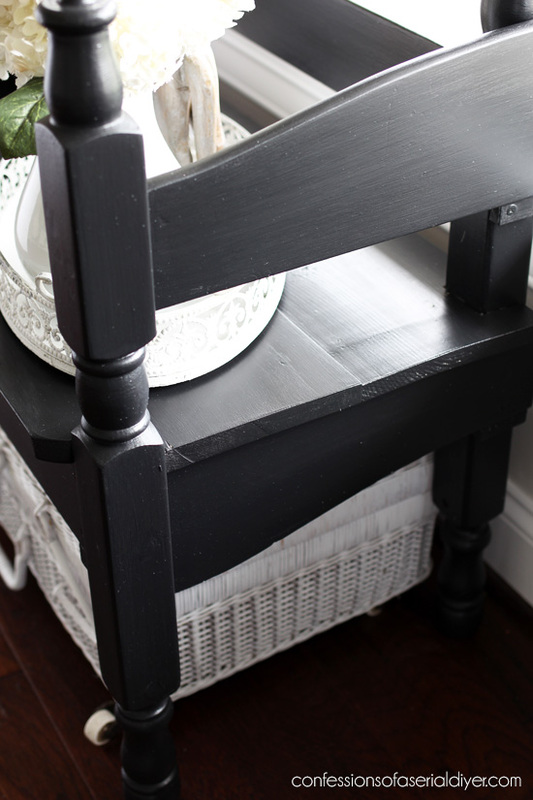 I found an old can of Country Chic paint in Liquorice which was just perfect. 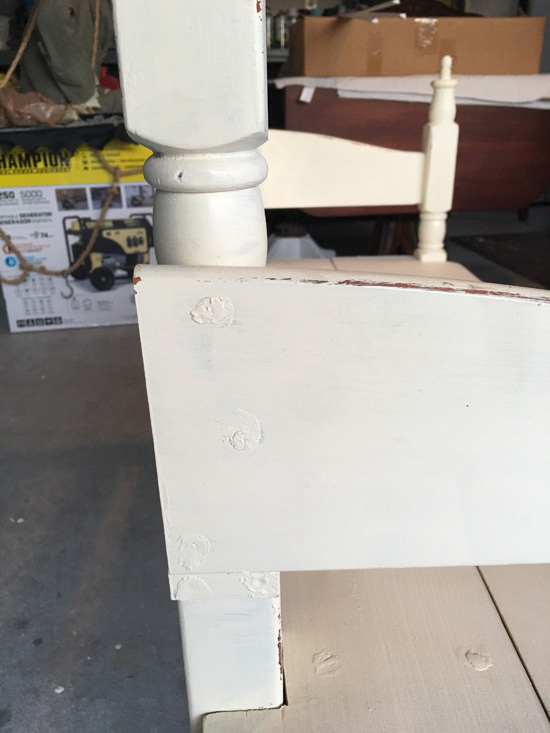 I gave it two coats and then sealed with General Finishes High Performance Topcoat in a flat finish, using my favorite brush for applying topcoats. I didn’t do any sanding this time as I didn’t want any of the off-white underneath to show through. 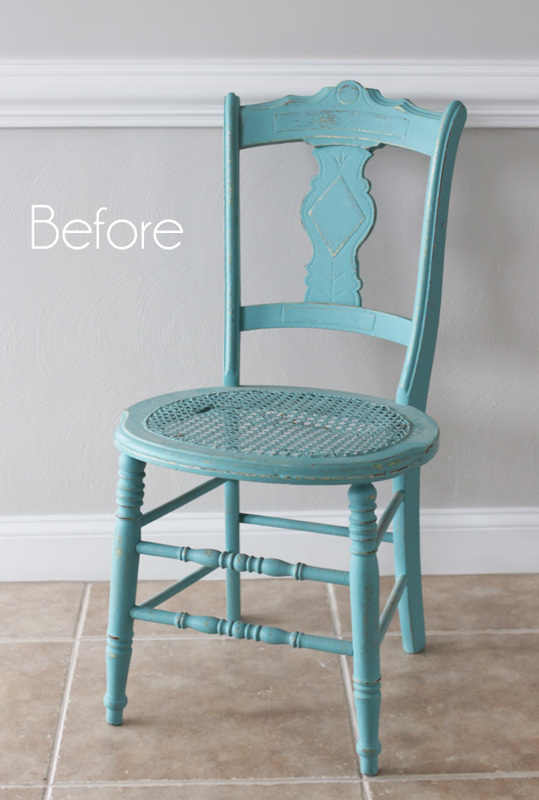 I painted it white in my Bit of Sugar DIY chalk paint and then sanded it to get a shabby look. I sealed it in the same sealer I used on the bench. Adding your house numbers would be a great idea here too. 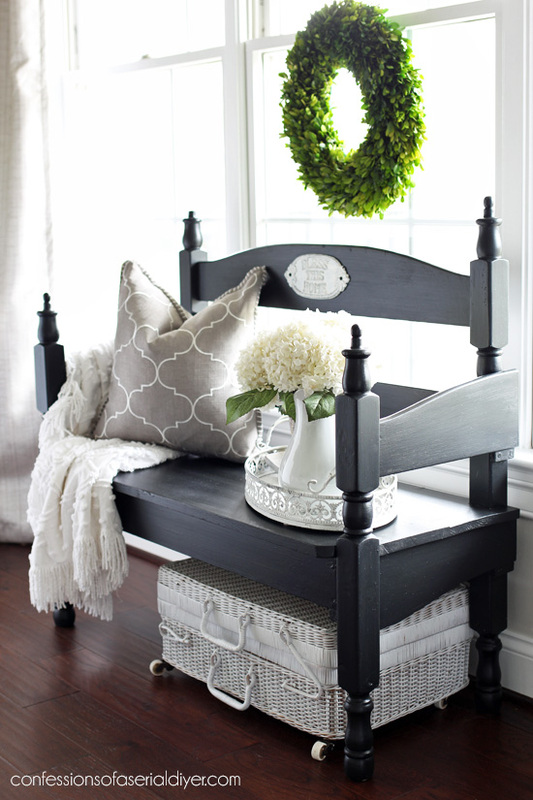 What do you think about this sweet bench’s new look? It’s not my normal bright and coastal, but I enjoyed doing something a little different this time! 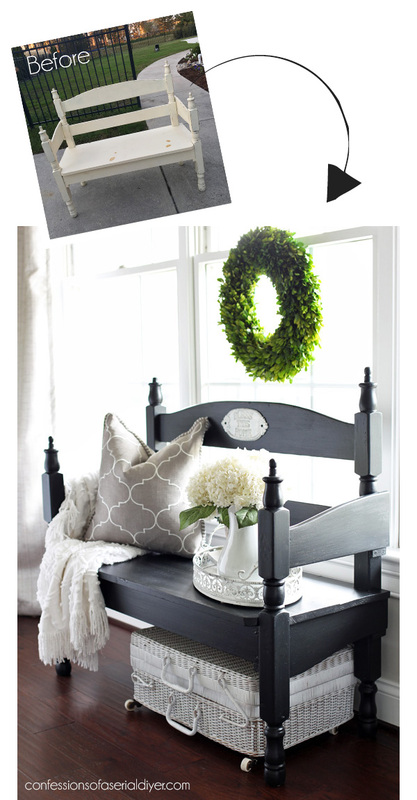 For a how-to on creating a bench from an old headboard and footboard, click HERE! Don’t forget my girls have treasures of their own to share today! 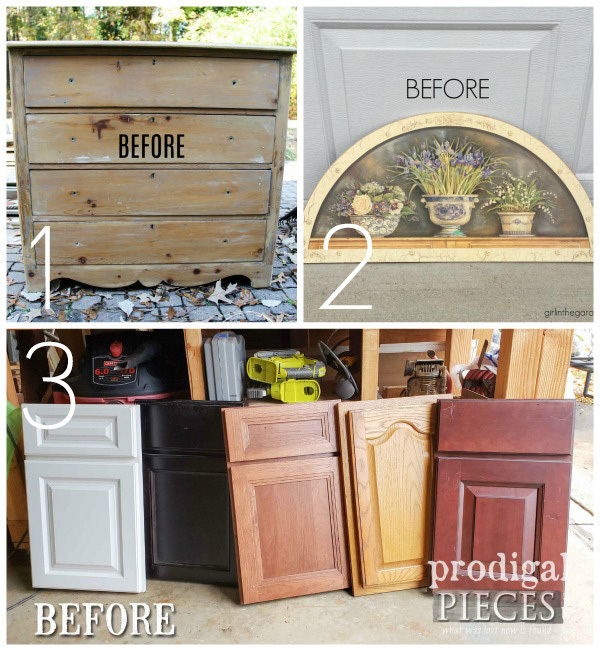 Click the links below the image to see how their makeovers turned out! I love how that came out. I was shocked when you went black! Now does mom get the bench back or are you keeping it? I love the plague you put on the back, it looks great. 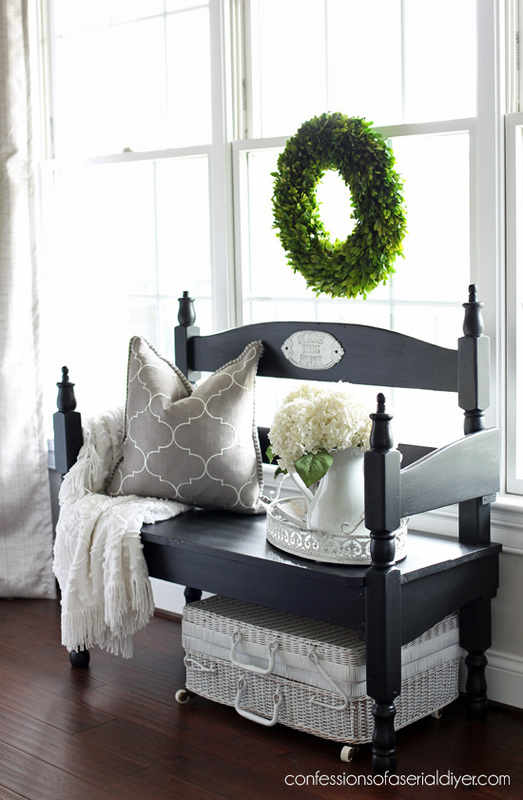 I know you have built benches from head boards, I love how they look, wish I had a bigger front porch to put one on! Beautiful. Like that you painted it in black; looks so classy. Very nice touch; adding of the little plaque. A little touch like that makes the whole piece. It just adds a nice extra touch to the bench. I do have one question. What can a person put over knot holes to keep them from bleeding through a light color paint? Love the black. Admit I was surprised but it is lovely and the little plaque is very sweet on it. Another great job. Wow, Christy, way to shake things up with black! 🙂 The pesky knots won’t be pesky any longer. Very sleek looking. The plaque is just the right touch. I look forward to seeing what you create with the chair. Enjoy your week to the hilt. The look in black is a nice change. And the decorators always says you should have something black in each room. It looks so nice. How beautiful!! It’s always fun to change something up, and you did this one so good. Pinning! Christy, once again, another beautiful piece! I love black furniture and the finish is perfect. The plaque you added looks great. You have a knack for finding the perfect embellishments. Love it! Thx for sharing. I love all the white paint you usually do but this black version looks so good too! I was so surprised that this wasn’t one you had made, Christy. (Of course, yours wouldn’t have had those defects to begin with!) Sometimes I try to guess what you’re going to do, and this time I got the dark part right, but I thought it would be Frenchy. Or striped. 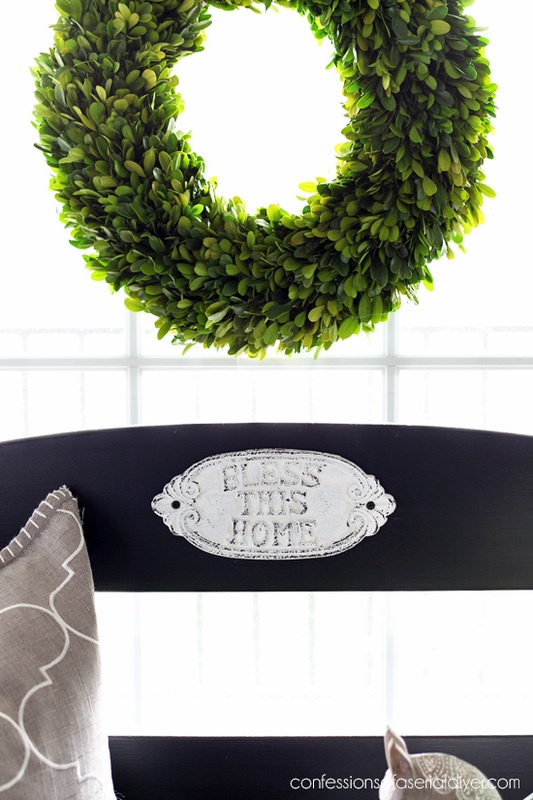 😉 Such a beautiful update, ready for a porch or entryway. ❤️the bench re-do. Especially the black. 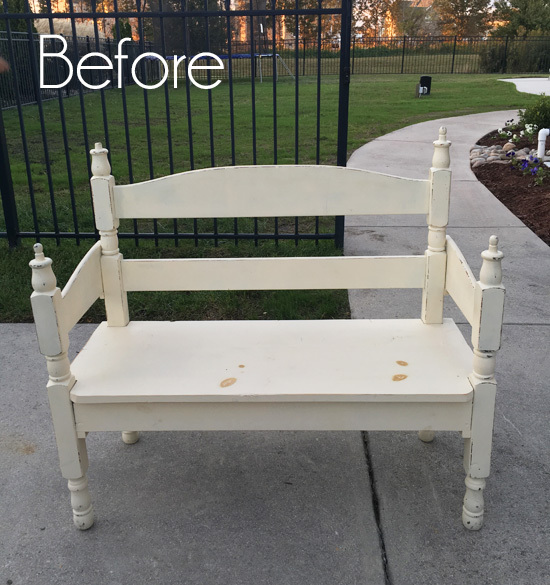 Christy – I’m always amazed at how a change of COLOR can totally transform something – you bench is the perfect example of that. Wow! 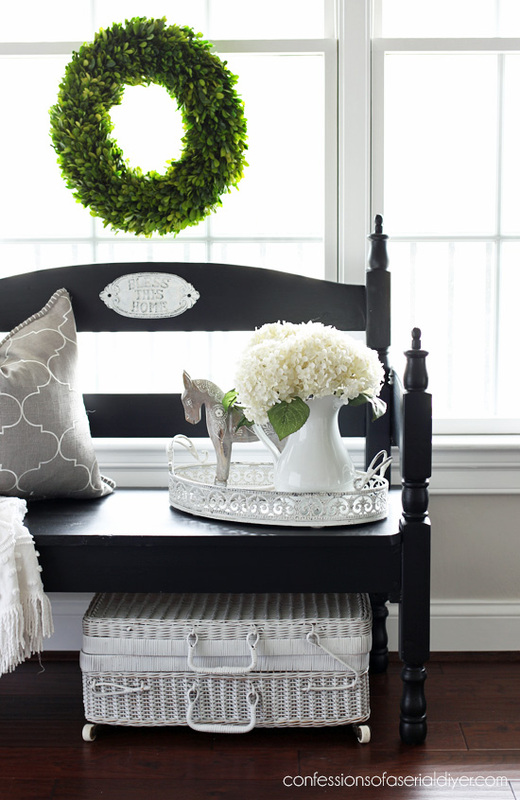 This is really a great bench, and I think I like it better in black—gives it some weight and it looks to be sturdy. No one will be afraid to sit in it now! ❤️❤️❤️ this! I have a love for black as you do for white. What a great job, I may just have to make one of these! Thanks for all you do to keep us motivated! Love this site. I LOVE it!!! 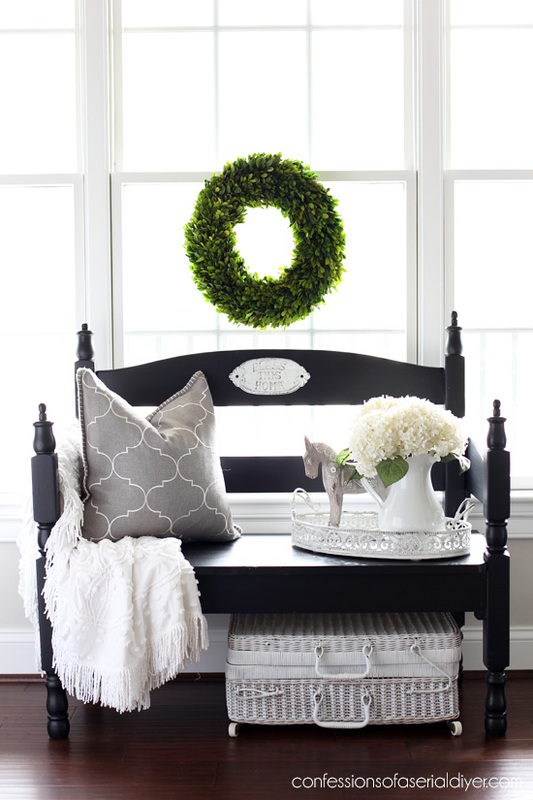 I love white painted furniture, but this looks fabulous painted in the licorice color!!! Great job! This is so cute!! It is definitely different that what I’m used to seeing from you but beautiful just the same!! I always find it funny the things I notice when I’m getting ready to paint something, things that have always been there that I just never noticed. Love your blog and look forward to each email!! What a beautiful new look! I love how your Mom passed the bench back to you and you gave it refresh. The plaque looks perfect too! I love that bench! Black is so classy and goes with most everything. WOW this is way out of your wheelhouse! I love it! The sleek black with the decal on the back is awesome! I hope it sells well for you. I know you aren’t usually I. To these colors but who knows.